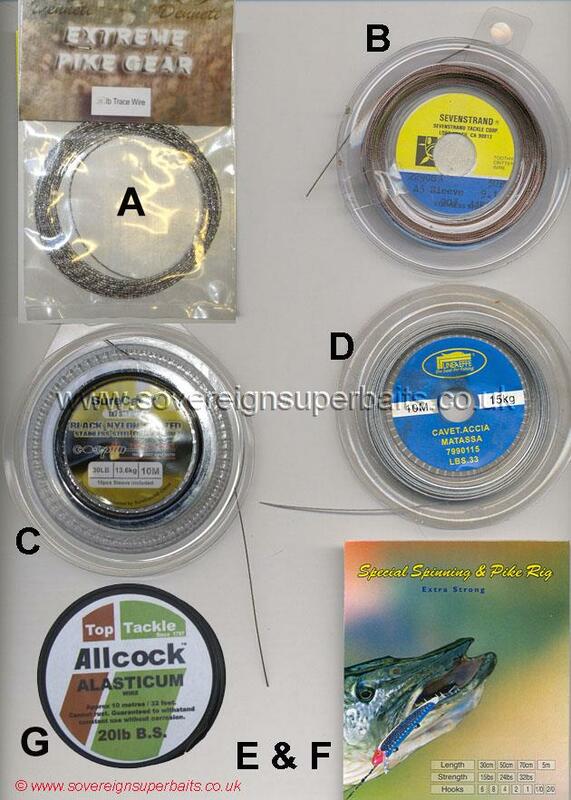 A. Aluminium cabled wire - This is a softer wire than stainless steel said to be kinder on the pikes teeth than stainless and has rapidly found favour with Musky anglers in the states because not only can this wire be crimped, it can be twisted, knotted or used with a twiddle stick. B. Sevenstrand uncoated (no plastic) stainless steel trace wire, as the name would suggest is seven strand. It is also copper plated to lower light diffraction, it also comes in 30’ spools, currently in 27lb and 90lb. It does NOT come with crimps. C. Surecatch Twist & Melt steel wire made by Surecatch is both blackened and plastic coated. It comes in 10m spools, is available in 20lb, 30lb and 40lb with ten crimps and as the name would suggest can simply be twisted and melted with a lighter, also usable with a twiddle stick. Nova silk wire crimps: After numerous requests we have managed to source the soft black copper crimps for Nova silk wire. Small for the 12lb wire, Medium for the 20lb wire, Large for the 30lb and 40lb wire. These are specially designed for this particular wire as they will not crush the wire because they are made from pure copper, currently available in bags of 100. G. Allcock Alasticum is a single strand soft (high nickel content) stainless wire for twisting and twiddle sticking and has been around as long as god! Special offer whilst stocks last, 15m for the price of 10. F. Sovereign 49-strand Nova silk wire, this is the Rolls Royce of all wires, as limp as cotton, thinner than braid, available in 6lb, 12lb, 24lb, 32lb. This wire is natural coloured, satin finished to lower reflectivity, can be knotted or crimped, is ideally suited for any fishing application. It’s superb limpness makes it a first choice for live / deadbaiting for Zander and it’s ultra thin diameter makes it excellent for ultraliting. Available in 5m coils with 12 black copper crimps. E. Sovereign 19-strand Nova silk wire, this is an ultra-thin, exceptionally flexible 19 strand trace wire, copper plated to reduce reflectivity and available only in 17lb breaking strain, 5m spools with 12 black copper crimps ideally suited for ultraliting. D. Linea Effe is a natural colour, seven strand, stainless steel plastic coated trace wire available in 33lb and comes with a dozen crimps and is sold in 10m spools. G. Allcock Alasticum, single strand (twiddle stick), 10m spool; Special offer whilst stocks last, 15m for the price of 10.